The thing that I love about California food is how everybody brings together dishes from their own cultures, and then it gets a very local twist with fresh veggies and produce. Sometimes things will get blended together in a really cool fusion dish – like the delicious ‘cholo fried rice’ I ate at The Must in downtown L.A. (it’s basically carnitas taco fillings mixed into rice – and incredible). Sigh. Who doesn’t want to be in California? That sort of stuff is what I think makes California cuisine special. It’s not any one thing in particular, but it’s a mishmash celebrating the diversity of the state. (Then, of course, you get all the crazy celebrity diet trends too, but that’s a whole different story). On my recent couple of trips home, I took some time to explore some of the Golden State’s markets and food scene. The Boqueria they are not – that’s Barcelona’s famous market – and this is something that I just can’t see happening here in BCN…at least not for a very long time. There’s nothing here that quite compares to the awesome mix of cultures and cuisines that’s on display in these two California markets. Grand Central Market, Downtown L.A.
Grand Central Market is a classic stop on a tour of downtown Los Angeles. 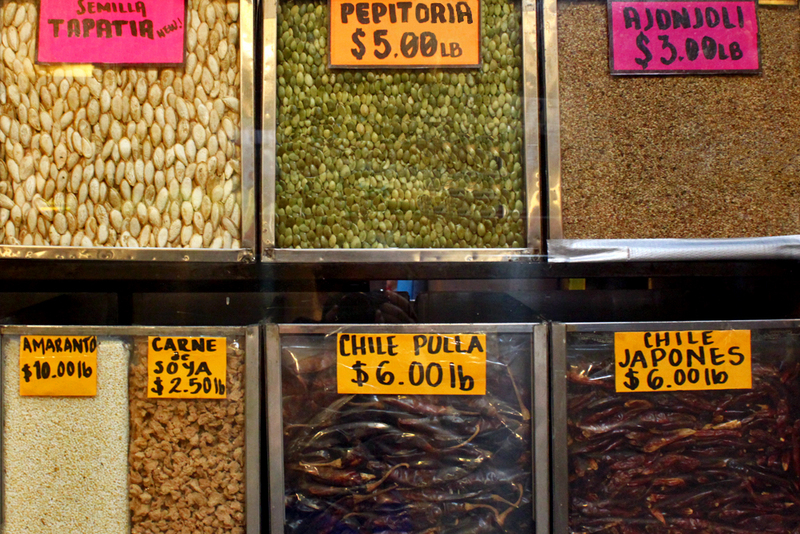 This market is bursting with bright neon signs and equally colorful vegetables, spices, and characters. It’s been an L.A. staple for years, dating back to 1917 (so not very old at all by European standards, but quite old by West Coast ones!). It’s always been a center for blending all kinds of food from different cultures, and that tradition is still going strong today. The large structure is filled with a mixture of stands selling all sorts of ingredients and tiny restaurants serving up piping-hot street food. As you make your way among the packed-in stalls, interesting and enticing smells occasionally waft your way from the mini restaurants. And I say ‘interesting’ because a lot of the time, you might be smelling something that’s completely new to you. It smells good, for sure, but you may not have any idea what it is that you’re smelling. They’ve got all kinds of products from all over Latin America, delicate French pastries, a traditional Jewish deli, Thai comfort food, fresh-pressed juice (for your Hollywood juice cleanse! ), Texas-style barbecue, currywurst from Berlin, and so, so much more. The cool thing about this market is that you can buy both the great smelling street food and the ingredients you’d need to make it yourself at home. They sell spices here that you’d definitely not come across at your local supermarket (not that I’m much of an expert on home cooking myself!). 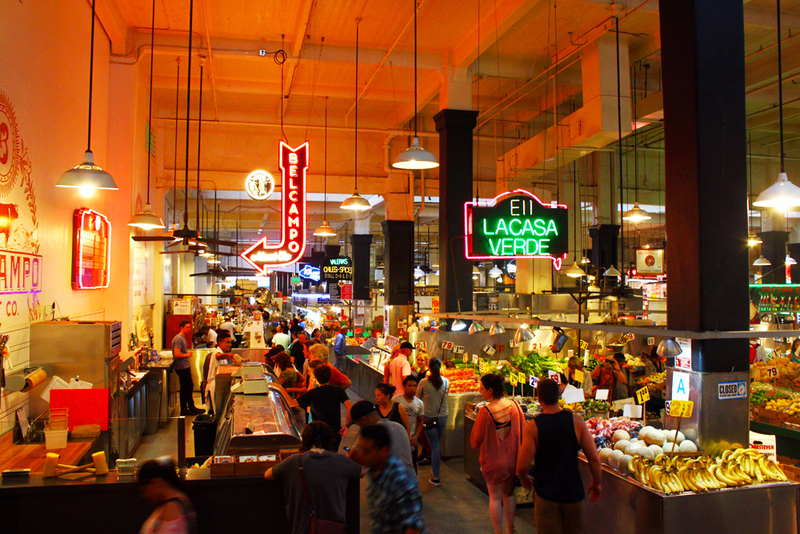 Grand Central Market also hosts occasional events like Día de los Muertos celebrations, yarn-bombing art expos, and spotlights on special foods. Check out their blog to see what’s going on. 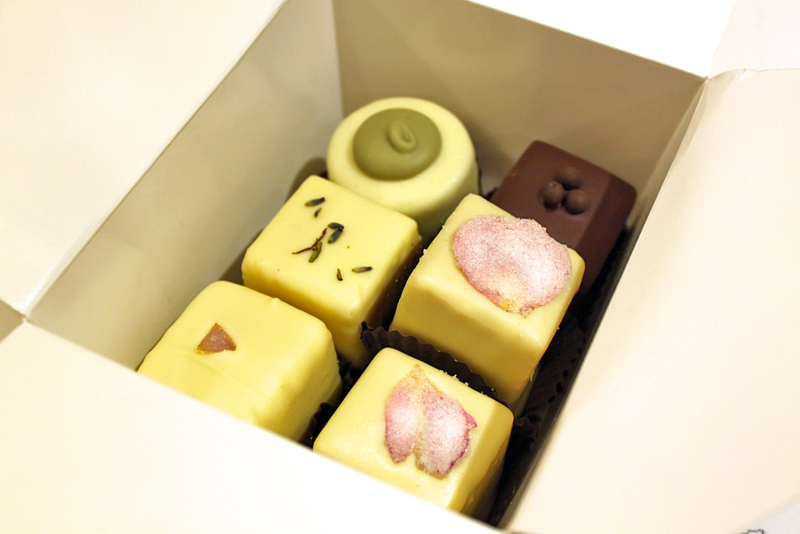 Delicate desserts to go from the French patisserie. While Grand Central Market blends together a traditional market with more modern street food stalls, The Packing House is all about the street food. Housed in an old orange packing house (hence the name), you can find all kinds of delicious treats to eat here, fancy twists on grilled cheese and other American comfort foods to traditional East Asian hot-pot to Indian curries…the list goes on and on. I rather felt like going on and on myself and trying more of the places, but there is a limit to how much you can humanly eat in one sitting! Some of the places are just too trendy – like the restaurant we tried that had sandwiches on waffles instead of bread and gave you tater tots instead of fries. But most of them are really, really tasty. It’s worth taking a good long look around before you decide what you’re going to eat, although not just for getting a look at what’s out there to munch on. It’s because there are lots of interesting displays and information about the history of the Packing House when it was just a packing house, no capitalization necessary. The place also has live music and performances, which you might catch if you get lucky. There’s only one downside to the Packing House, which is that the lines can get a little crazy on weekends for some of the more popular places. But let’s not end on a negative – I have a little insider secret for you. Go and sit on the back outside patio and you’ll get a pretty good view of the Disneyland fireworks. And actually, because I’ve eaten outside both times I’ve been there, I didn’t take any pictures of the food! (Oops). 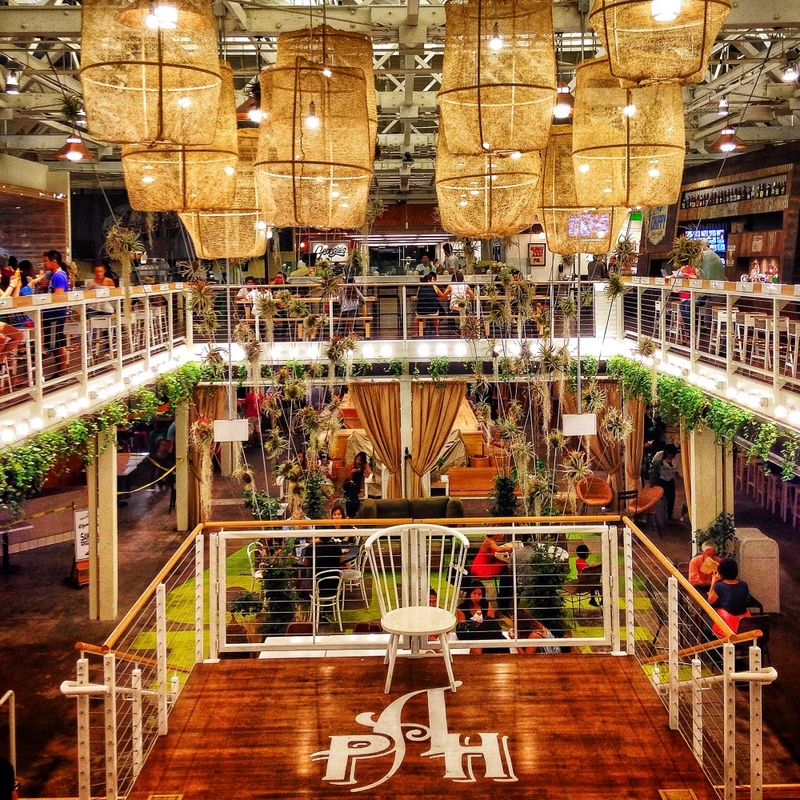 Apart from being cool new takes on traditional markets, Grand Central Market at the Packing House share one other thing – they’re hot spots for some incredibly tasty food, mixing together all kinds of culinary traditions from around the world. It’s a very cool way for California’s multicultural population to come together and celebrate differences over common ground – delicious food. Because, let’s face it, who doesn’t like to eat tasty food in good company? What’s the coolest market you’ve ever been to? Tell me about it in the comments! Great post! 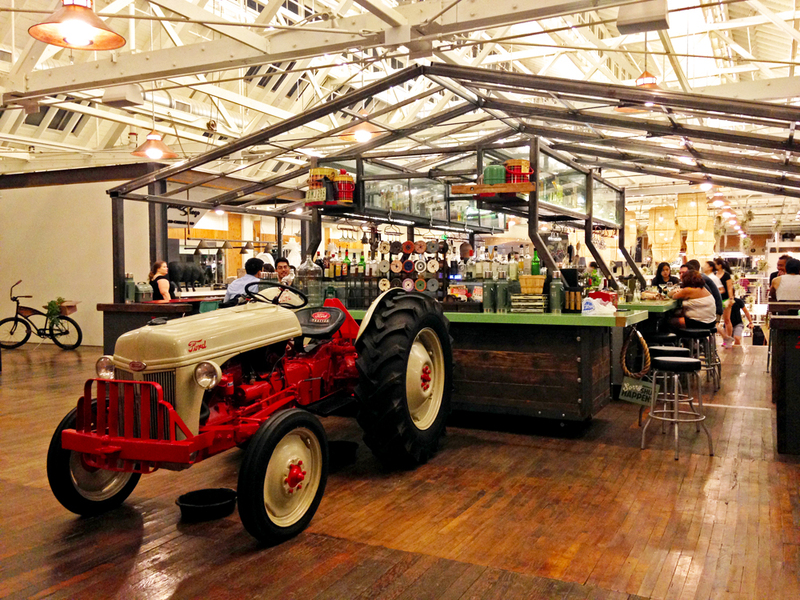 The Packing House looks so good, and this is something I want to take into account for when I visit LA! wow, all my years in L.A. and I not only never went to the Grand Central market, I never even heard of it! shameful huh? I grew up there! but not near downtown so I guess I could get a pass. I do, however, know about The Pantry. A very cool restaurant downtown that we visited when last there. Bring your appetite as portions are huge! I love markets and especially the farmers markets we have here. Loved La Boqueria and Las Atarazanas in Malaga. Hoping to check out one in Madrid when we’re there next March (2016) but I can’t recall the name, Las Cebollas maybe? anyway, fun post! If I get back to L.A. I definitely want to check out that market! Yeah, L.A. is so big I can definitely see how you might not have heard of it! Plus, didn’t downtown used to be really, really sketchy? The Pantry sounds awesome, I’ve never been there but now I think I might have to! There’s another great one in Madrid called the Mercado de San Miguel that sells lots of delicious prepared food. It was one or both of the top two, Centro Comercial de la Paz and/or Mercado de la Cebada. Cebada, cebolla 🙂 we have been to San Miguel and yes, that one is great! yes, do check out The Pantry, great experience. I know you will enjoy it! and yes, downtown L.A. did used to be sketchy. it’s very different now. Ooh nice! I had no idea there were so many cool markets in Madrid. I actually walked all around the outside of the Mercado de la Cebada without knowing what it was (it was closed that day). I haven’t yet been to those markets even though I’m from SoCal, so I will have to check them out! Seriously, though… all of these Spanish think our food is crap! I miss Cali food so much! Yeah, tons of people here think American food is so bad! It’s just because they think it’s McDonalds all the time, and that IS legitimately bad haha. No McDonalds?, No Starbucks? No KFC? Only fresh and healthy food?… Are you sure these places are in EE.UU.? The markets in LA look appealing. Especially the dessert. The most interesting market I´ve ever been to was the morning market in a small town along the Mekong in Laos. They offered fried buffalo skin and other (weird) delicacies. It was an interesting experience to go there at 6:30 in the morning. The mist was hanging in the woods and the people were as interesting as the food they were offering. Nice picks!! 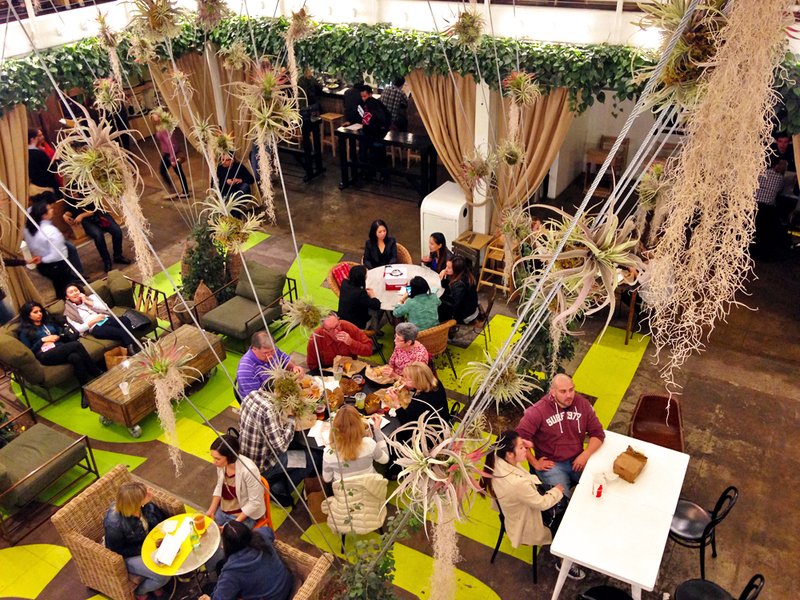 Despite its name, the packing house looks REALLY nice inside and really contemporary! I love that both these markets serve fusion dishes and dishes from so many different nationalities- we are a melting pot in melting in America! One of my favorite markets has been Granville Island Public Market in Vancouver- it has a lot of the elements of these 2 markets you mentioned (like different cuisines) and also a lot of hand made items like soaps with natural and organic ingredients and hand-sewn dolls. I bet you’d love it! Yeah, I love trying out food from all over the world – and if you can do it all in the same place, then that’s just a bonus! Granville Island Public Market sounds really cool too, I’ll have to add that to my never-ending “to travel” list. 😀 Thanks for the recommendation! Amazing ideas! Who doesn’t want to be in California indeed! I am stunned by the pictures. How do you edit them to appear so impressive? I actually don’t do very much to them, to be honest! I usually boost the contrast and saturation a tiny bit in Photoshop. If it’s a photo I took with my phone (like the square one of the Packing House) I use Snapseed to edit it. I def wants to be in California!!! Love that place and the restaurants in LA are amazing. The coolest mkt I’ve been too was in Turkey, but food market I must say Borough mkt in London. Oh there are some fantastic markets in Istanbul! I don’t think I’ve been to the Borough Market, but it’s on my list now. Thanks for the recommendation. Great post, always wanted to visit California but never really thought about this side of it. Looks like there are some amazing markets to explore and some delicious and interesting things to discover. When we eventually visit we will be using this list! Thanks! There are lots of really delicious things to discover in California – even though the U.S. gets such a bad reputation for food! Cool post. I have always wanted to visit this sunnier side of the states. I really do hope this or early next year before my US visa expires. Oh I hope you get to go – California has so much great stuff to see! That looks really cool! The coolest market I’ve ever been to is perhaps the oriental market in Kreuzberg, Berlin. So many cultures together, producing delicious food. Ahh I wish I’d gone there when I was in Berlin! Kreuzberg has such a cool vibe, I bet that’s a really great market. I always loved Norwich market when I lived there; the idea that the market had been in operation for 900 years in the same spot made it special, and the local fruit and veg were so good. I’ve been to a lot of markets around the world and I love that the US is starting to get more and more. Especially the Farmer’s markets here in Seattle. They are a lot of fun, fresh food and really nice people. Love love love! Me too! I’ve heard great things about the farmer’s markets in Seattle. The first picture looks like it was taken from paradise! It translate SUCH a nice vibe! Thanks, Olga! 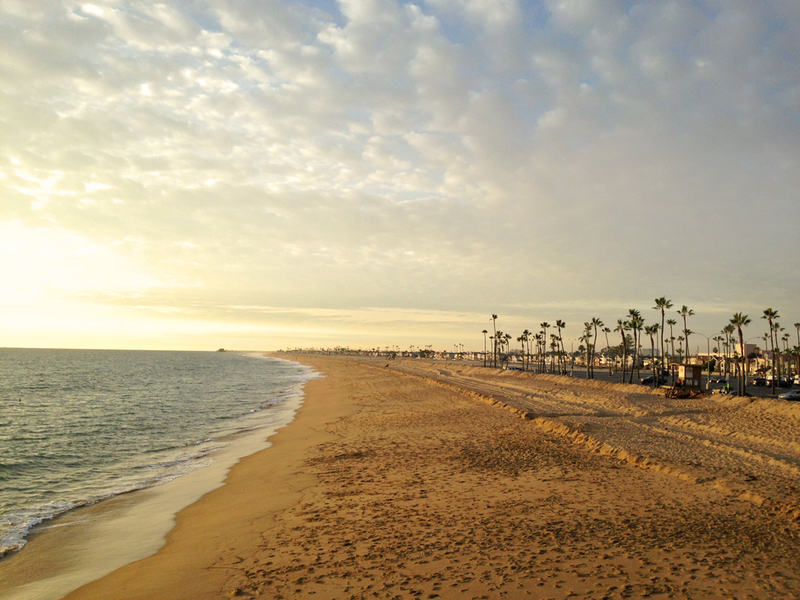 California is pretty much paradise to me haha. I have been to a few markets around the world but this looks like it has such a California vibe. Hope I get to visit soon! It’s true, the weather is nice all year round in a lot of California! 🙂 I hope you get to go someday, and glad you liked the post.